The NASBA Center for the Public Trust (CPT) recently wrapped up the 7th Annual Ethics in Action Video Competition where students across the country submitted videos displaying examples of ethical dilemmas they may face in their careers. The CPT team was positively overwhelmed by the quality and quantity of the video entries. Consistently a hot topic in the workforce, the wage gap is a social responsibility issue that young and seasoned professionals are passionate about. This year, Colorado State University created a compelling short film, comparing a male and female job candidate who have equal qualifications and are applying for the same job. This entry was a runner up for the grand prize in the Short Film Category. View Colorado State’s entry here. Neatly presented in under three minutes, the Maryville University team concisely demonstrates a real-life ethical dilemma, much like the ones we share with our students when we say, “Just because you are a good person does not mean you are immune to unethical gray areas.” View Betty’s Call here. Two teams submitted concepts that highlighted conflicts of interest: nepotism and biased decisions. Oral Roberts University was awarded the first prize in the commercial category with their entry: Nepotism. Loyola University New Orleans was awarded a new prize, instated this year, to recognize their efforts for the short film: Biased Decisions. These two submissions presented clever and unique ethical dilemmas that young professionals may face during their first entry level positions. Leaving room for discussion, the aesthetically pleasing videos end with thought-provoking finales. We encourage you to check both of them out here. 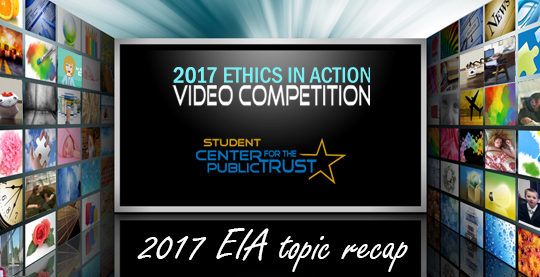 The CPT would like to thank the hundreds of students who participated and made the 2017 Ethics in Action Video Competition a success. Your advocacy for ethical leadership on your campus is helping us develop leaders across the country. We are gearing up to launch the 2018 competition in the fall, so stay tuned!